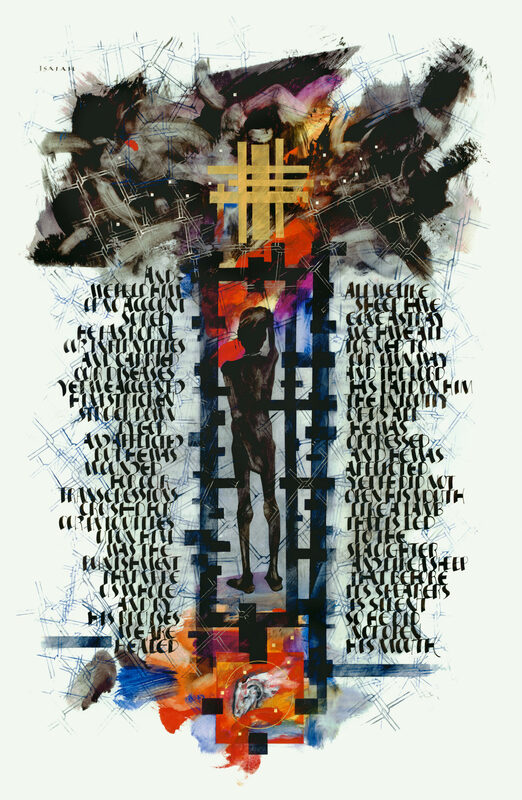 Suffering Servant, Donald Jackson, Copyright 2005, The Saint John’s Bible, Saint John’s University, Collegeville, Minnesota USA. Used by permission. All rights reserved. A Blessed Good Friday of the Lord’s Passion. This is the day to gaze on Love—a day, in the words of the Palmist, to “Be still and know that I am God” (Ps.46:11). What other stance can we take before this ancient text attributed to an anonymous poet who prophesied the fate of the Servant of God? Despised, discounted, and erased, the Suffering Servant descends into a terrifying darkness depicted in this illumination by ominous storm clouds. Yet, one cannot be with this text without hope. From the very first verse we hear, “See my Servant shall prosper; he shall be raised high and greatly exalted” (Is. 52:13). We are encouraged to hold the entire Paschal Mystery of suffering and triumph here—yes, even as we behold the Crucified One. This great messianic oracle is fulfilled in the passion, death and resurrection of Jesus. Be still, and gaze on the Love that from all eternity is poured out for us. Hold the Mystery. Living in a world where countless people feel despised, discounted, and erased, we pray for the grace to hold Hope for them. From ancient times, God’s revealed word calls us to hold the entirety of this Mystery as one. With words of mercy, Pope Francis calls us to behold the Suffering Servant in our brothers and sisters who are in anguish: “Jesus invites us to behold these wounds. Through these wounds, as in a light-filled opening, we can see the entire Mystery of Christ and of God, filled with compassion for the weak and the suffering” (2015 Divine Sunday Homily). Gaze on the emaciated figure with his back to the viewer and holding his head. He appears to be confined to a cell of some sort, surrounded by a fiery, terrifying darkness. Yet he is standing and at gazing at the illuminated cross. The Mystery of suffering and glorification is here. Where is the Suffering Servant to be found today? In Flint, Michigan? In African American teens fearing to be shot by the police? In refugees in search of home? In immigrants living in fear of deportation? In the homeless and the hungry? Am I being called to enter the terrible darkness with them and carry the illuminated cross to the suffering? Can I hold the entire Mystery for and with them? Gaze and you will learn the Mystery of dying and rising. Mary Frances Reis, VHM is a member of the Visitation Monastery of Minneapolis. She and her community are engaged in contemplative prayer and non-violent presence in North Minneapolis. She is an alumna of Saint John’s School of Theology and Seminary. This entry was posted in General, Lenten Reflection, Lenten Reflection 2016 and tagged Suffering Servant by Seeing the Word Team. Bookmark the permalink. Such a moving and challenging reflection, Sister Mary Frances, in the voice of one who sees and knows suffering daily in the lives around you and your sisters living in the Monastery of the Visitation/North Side. Thank you for your words and for the works of compassion and love that flow from your home and your hearts. No one is better equipped to experience the beautiful blessings of Easter than all of you radiant women.